Rabbits live 6 – 12 years, have distinct personalities and make excellent house pets. Proper food, exercise and socialization are all important factors in helping your pet achieve his full potential and live a long, happy life. To help your rabbit look and feel his best, you should groom him weekly. 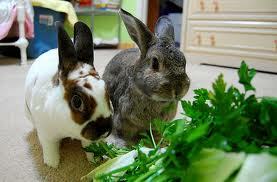 Take advantage of this time together to check your rabbit for potential health problems. Catching health problems early is also important to achieving a long, healthy life. In this section, we discuss housing, spaying and neutering, offer tips for grooming and bunny-proofing to provide a safe exercise environment for your rabbit.